My body has unionized. Every year I’m presented with more and more demands. When I was young, I was able to exploit and abuse my body—make it work overtime without compensation. And I could make it do just about anything for minimum wage. But no more. My stomach was the first to go Union. In the early stages of our contract negotiations, I thought I made it a fair offer, but it wouldn’t even come to the table. Each time I pushed, it pushed back. Our dealings were so stressful I developed chronic heartburn. Finally, I had to swallow my pride. No more dairy. Ever. Not even a little bit. Then no onions. Then not too much fatty meat. My stomach union got bolder, and our contract list of required working conditions got so long it took me days to digest it: no garlic, no barbecue sauce, nothing with vinegar in it, including mustard and ketchup, not too much salt, no beans, no cabbage, no pickles, no chili—ever again, and alcoholic beverages only in the smallest doses and only for medicinal purposes. I’m not proud of my bargaining skills, but do you think you could’ve done any better? I mean these guys when they don’t get their way, they throw acid at you. Besides all the restrictions—my stomach started demanding more and more time off. Before the union, it had routinely put in 20-hour days. Did I want an extra dessert at 1 or 2 a.m.? “Piece o’ cake,” my stomach used to say. But that was when my stomach was still a teenager—before it had a family and lots of bills to pay. Our new contract calls for 7-hour shifts only: noon to 7 p.m. My stomach also now refuses to process big orders. And it wants benefits like a drug program providing antacids and Proton Pump Inhibitors. I’m at the union’s mercy. What am I gonna do? Get another stomach? I’m over a barrel. What really hurts is that despite the many, many concessions I’ve made, there are some indications my stomach’s still not happy. I’ve heard rumblings. A couple of years ago my feet held their own big meeting, and the upshot was that I had to sweeten their deal. I’ve had to pad them with orthotic shoe inserts ever since. “A little cushion in the contract is just standard, Buddy,” they told me. I realized that when it came to my feet’s demands, I didn’t have a leg to stand on. These are some rough, callous characters. I have to hand it to ’em: my feet’ve got balls. Of all my body unions, the neck is the most unreasonable. For one thing, it wants to go out all the time. Our dealings require constant adjustments. I’ve had to agree not only to frequent rest breaks on pillows made to exact specifications, but—and I blush to say this—my cervical employee has demanded that it get massages all the time. Who gets perks like that? I held out as long as I could, but finally gave in. I’m so embarrassed I can hardly hold my head up. Well that’s about it—the story of my body’s dealings, over 6 decades, with a powerful anatomical labor movement. I wanted to provide you with a clever, satisfying ending, but, I’m sorry to say, my brain just went on strike. My thanks to Wildacres Retreat, where this piece was written. What a treat Wildacres must be. You really fleshed out the bones of this and it’s so humerus. Wildacres is both a treat and a re-treat. My gut has unionized, Bill. I didn’t know what was going on, but now it all makes sense. My negotiation skills must be poor because it’s winning. Maybe I’ll sneak out to Mexico and drink margaritas. Would sneaking out to Mexico be crossing the picket line? So? Call me a scab. (I’m sure there’s a clever retort about bodies and scabs and unions, but I can’t think of it.) I’m sure you’ll find one Bill? Shoot, I used to be able to eat the chrome off a bumper and a few hours later eliminate steel wool. These days if I have cheese for lunch the whole system shuts down.I keep a dish of antacids on the kitchen table as if they were after-dinner mints. It is a sad situation. It will only get worse as the years go flying by. Really funny piece, Bill! I love your opening sentence, Denise. You must be a writer. oh Bill Spencer, we have to find you a labor lawyer who will work out all the kinks in your contracts? So funny! I think I need Cathy Sikorski to represent me. She’s such an expert in helping the elderly with legal bargaining. 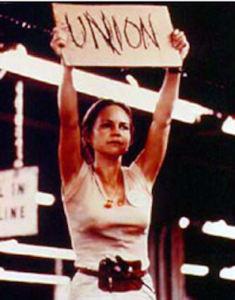 I used to be a fan of unions, but now I’m realizing their power is far too great, especially the marital union. As long as you can keep your funny bone indie, we’ll all be okay. Mamie, it was great getting to see you at Wildacres. I just saw some of your professional photos: they’re gorgeous! Unfortunately, each body part has a separate union. They don’t work together. As a result, we end up taking so many different medications that we feel like walking pharmacies. Maybe WE should go on strike. Oh wait! We’re management. Well, scrap that idea. I have to go take my meds, anyway. My brain tells me to exercise more, but my knees say no.